Yacht Registry is pleased to assist you in the purchase of this vessel. 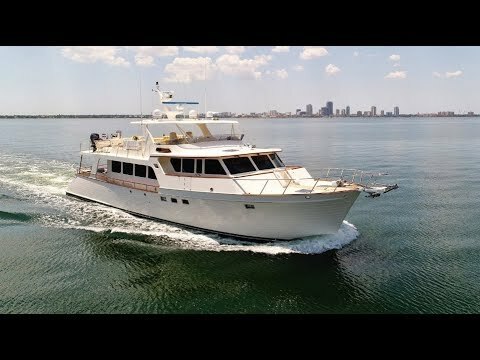 This boat is centrally listed by Luke Brown Yachts - Ft. Lauderdale. Dreamliner has two guest staterooms plus crew quarters. The master stateroom is a beam to beam cabin with a king size bed surrounded by teak and glass cabinets providing abundant storage. No comfort is spared as this room includes a writing desk, swivel pedestal chair, small settee, and a large flat screen TV. Dreamliner's master stateroom also features his and hers ensuite heads with an adjoining shower. The VIP Stateroom has an island king berth, teak cabinets, flat screen TV, ensuite head and shower. The second guest cabin features side by side single berths with an ensuite head and shower. Marlow Explorer Yachts are limited production yachts built under constant supervision and stringent quality control procedures. The Marlow Explorer 78E is designed and built to cross the oceans of the world in comfort and safety while the proprietary Strut Keel technology allows inland and island cruising with fully protected running gear. • Anchors – S/S Danforth 80lb and S/S Blue Sea Plow type 88lb, each with 3/8"
Only the finest components like Dupont Kevlar, CoreCell and engineered construction fabrics are specified for the hull, deck and superstructure of this Marlow Explorer Yacht. Vinyl ester Epoxy resins and glues are used throughout. Only top quality mechanical components like Aquadrive constant velocity couplers, CAT marine, Tides seals, Master Volt converters are used. In the lovely hand finished interior, quality brands like Sub Zero, Dacor, GE, Miele, Grohe and similar are found. Fine fabrics of Ultra-leather and other top brands grace the interior. The result is reminiscent of an era when quality, not quantity was the hallmark of a fine yacht.